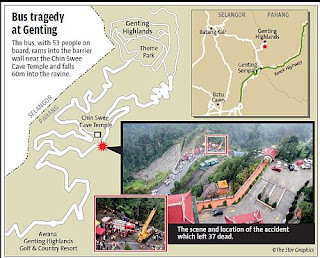 37 killed, 16 injured in Malaysia's worst road tragedy, after a bus carrying 53 plunged into a 60m ravine near Genting Highlands around 2.45pm 21st August, Wednesday. The 16 survivors comprised seven Malaysians, three Indonesians, four Bangladeshis, one Thai national, and one Korean. The bus was carrying passenger going downhill when the driver lost control over the bus and plunge into the ravine. 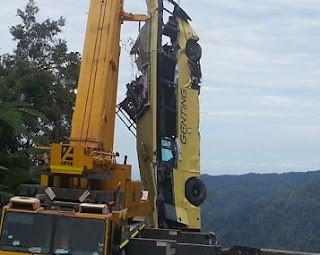 The bus was overloaded as its capacity was 44 passengers.